BCA exists to bring glory to God by training children in the nurture and admonition of the Lord. The chief goal at BCA is to train the students after the pattern of Jesus Christ. Luke 2:52 says that “Jesus increased in wisdom and stature, and in favour with God and man.” We want each child to grow intellectually (“wisdom”–the right use of knowledge), physically (“stature”–physical education), spiritually (“in favour with God”), and socially (“[in favour with] man”). In order to pattern ourselves after the Lord Jesus Christ, we strive for academic excellence. We want our students to progress individually and corporately as far as possible. Each year our students take the standard SAT tests to guage their educational progress. Every six weeks the parents will receive a report card and half-way through every six weeks period, the parents will receive a student progress report for his child. Every week the parent will get a home-work packet to examine in order to keep track of how his child is advancing. The school year begins at the beginning of September and lasts until the end of May with days off for holidays and three weeks of vacation (Christmas and Spring). Our school week is Monday through Friday, each day from 8:30am to 3:00pm. The school office is open at least a half day, Monday through Friday, all summer except for two weeks in July when the office closes. Much of the month of June will be used to supplement and aid students through a summer school program. Enrollment at BCA is open until 8th grade. The high school (9th-12th grade) has a closed enrollment. To attend the high school, extra requirements must be fulfilled. For instance, a senior high student must himself want to attend Bethel Christian Academy and must sign saying that he wants to be in the school. You can learn all of the requirements by calling the school office. Our kindergarten is a full day, wholly educational class. A kindergartner at BCA will end the year knowing how to read. That ability will be displayed at the year end graduation ceremony in May. To enroll at Bethel Christian Academy, a student will be tested. He should be at least five years old by December 1 to enter kindergarten (with a few exceptions) the next year. Certain fees must be paid for registration, etc., for office and administration costs and text books. Bethel Christian Academy teaches Bible class every day with chapel on Fridays. Students will memorize at least a verse or a portion of verse of Scripture every week. Since Scripture is the truth (John 17:17), this is an advantage for anyone. Biblical character and behavior will also be enforced as the standard for Bethel Christian Academy. The school verse is Ephesians 6:17, “. . . the sword of the Spirit, which is the Word of God,” and, therefore, our school mascot is The Swordsmen. Tuition is the same for everyone. However, you can receive tuition help based upon your income. You can pay your tuition earlier and receive a discount. You can also pay your tuition in a monthly payment for ten months. Paper work will need to be filled out with certain information required. You can find all that out by calling and then visiting the school office. Bethel Christian Academy has consistently been one of the, if not the, lowest priced schools in the whole area. We have kept the costs lower chiefly so that more parents can see their children receive a Christian education. The parents of students at BCA are encouraged to participate in several activities. Certain involvement of parents will be required for enrollment at BCA. Research and experience has shown that parental involvement is the chief factor in the success of children in education. Because of this, we must expect participation from parents. BCA will have an open house, school programs, and parent-teacher conferences. Each parent, upon enrolling his child or children at BCA, will receive a student handbook that will lay-out all of the rules and requirements for students and parents, including the means of contacting and communicating with a teacher. Each parent should carefully read the student handbook. BCA will do fundraising during the school year. It is impossible for the school to operate financially without doing some fundraising. We encourage all of the students to participate and the parents will have a big part in fundraising success. A few of our parents have actually led one or more of the fundraisers. BCA uses homework as one means of education excellence. Students will be required to bring home books and do homework assignments. We do our best to keep this to the minimum necessary for the child to properly learn his subjects. Homework will not usually be assigned on Wednesdays, so that young people might attend mid-week services in the local church. 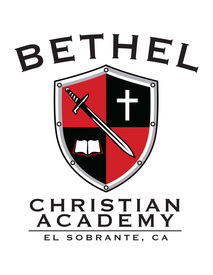 Bethel Christian Academy students will have the opportunity every year to participate in several extra-curricular activities, including drama and music programs at Christmas time and in the Spring. Every year BCA holds a spelling bee, a speech contest, and a history and science fair for the whole school. Beginning in fifth grade, students can participate in the BCA orchestra. To do so, we encourage the parents to enroll their children in private lessons. We have our own piano instructor who will give piano lessons during the week right on campus. Beginning in the sixth grade a student can try out for the basketball and volleyball teams, which compete against other schools about the same size as BCA. Every year in March, BCA holds an annual academic meet, which includes history, math, track and field, art, chess, ping-pong, and home-economics contests, among several others. Your child will have many opportunities to grow and learn at BCA, even outside of the classroom setting.